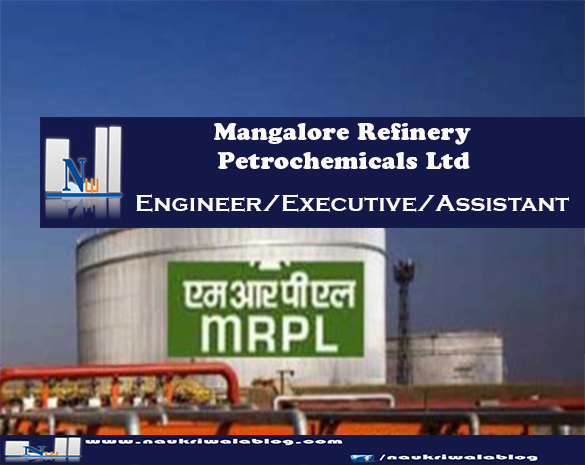 MRPL, a schedule ‘A’ CPSE and a subsidiary of ONGC is a State of Art Grassroot Refinery located in a beautiful hilly terrain, north of Mangalore city, in Dakshin Kannada region. The Refinery has got a versatile design with high flexibility to process Crudes of various API and with high degree of Automation.MRPL has a design capacity to process 15 million metric tons per annum and have 2 Hydrocrackers producing Premium Diesel (High Cetane). It also has 2 CCRs producing Unleaded Petrol of High Octane. Qualification : Bachelor Degree in Engineering in Computer Science/ Information Technology with minimum 40% marks from affiliated university or instituted . Qualification : Two years MBA/Equivalent with specialization in Materials Management or Bachelor Degree in Engineering with minimum 40% marks from affiliated university or instituted . Qualification : Two years MBA/Equivalent with specialization in Personnel Management/HRD/HRM or Two years Post Graduate Degree/Equivalent in Personnel Management/IR/Labour Welfare with minimum 40% marks from affiliated university or instituted . Qualification : CA/ICWA/two years MBA/Equivalent with specialization in Finance with minimum 40% marks from affiliated university or instituted. Qualification : 3 years BA/BSc./B.Com/BBA/BBM/BCA degree with minimum 40% marks. Knowledge of computer is essential and shall be proficient in MS Office (MS Word, MS Excel & MS PowerPoint). Candidates with Certificate in English Type writing Senior Grade shall be given preference. Candidates should submit their applications in the enclosed prescribed format, affix recent passport size photograph along with self attested photo copies of Date of birth proof, Educational Certificates (Semester-wise / year-wise marks sheets and Degree / Diploma certificates) and PWD Certificate, in the format prescribed by the Central Government. Address: Sr.Manager (HR-Recruitment), Mangalore Refinery and Petrochemicals Limited, Post Kuthethur, Via Katipalla, Mangalore-575030, Dakshina Kannada District, Karnataka state.